As discussed earlier in (Re)Defining Documentary Photography – Then and Now, the very nature of photography is subject to manipulation and thus, questions are raised regarding our concept of “fact” and “fiction.” Once the photographer raises the viewfinder to their eye, that very act suggests control and manipulation over how the photograph will reveal what is being recorded. This control and manipulation is not a bad attribute, but rather, more accurately suggests and reveals the conceptual, aesthetic and technical intentions and choices made by each individual photographer. What is photographed. How the subject is photographed. The nature of technical execution. The means of presentation and dissemination to an audience. And most importantly, particularly in documentary practice, why the subject is photographed by the individual photographer, and what purpose/role/function the photographs will serve. Such issues raise some questions on documentary photographic practice, including the photographer’s intentions, how the photograph(s) is(are) considered within particular contexts (as source of social/historical evidence; politics, ideological positions and propaganda; class, race, culture and gender; “victimization” and photographing “the Other”), and the responsibilities of the photographer (ethical and moral) to their subject and to photographic practice in general. In the process of being a photographer, each individual may want to answer these questions for themselves in defining the essence of their photographic process, especially within the context of documentary photography. On a late afternoon and exhausted from photographing earlier as one of the photographers hired by the Farm Security Administration (FSA) to document the social condition as a result of the Depression, Dorothea Lange turned down a dirt road to investigate a migrant camp of pea pickers. In less than fifteen minutes, Lange was back on the road after making five exposures of a woman (Florence Thompson) and her children in the camp. 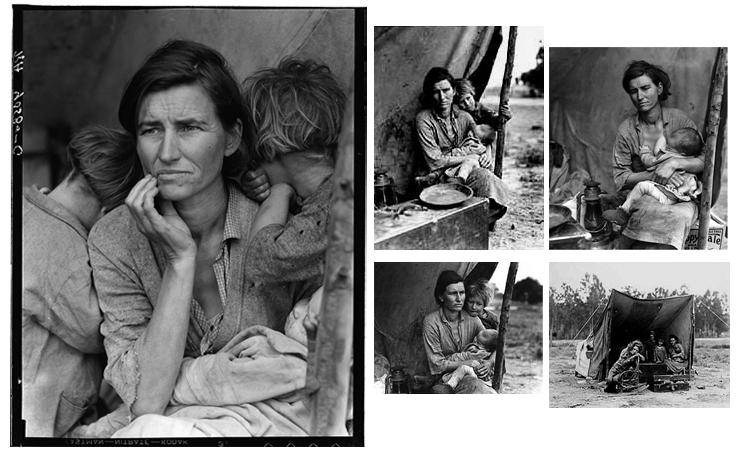 One of these images, Migrant Mother, became a symbol of the Depression as well as one of the most iconic and important photographs in the history of photography. 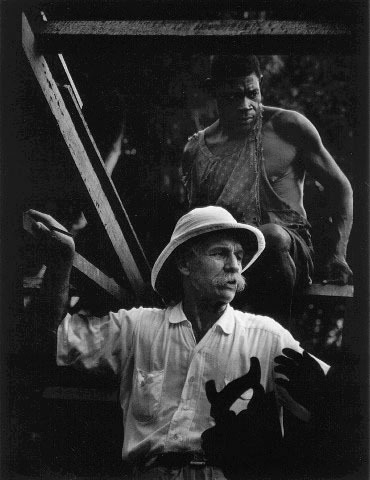 © W. Eugene Smith/Magnum Photos, Dr. Albert Schweitzer, Lambaréné in French Equatorial Africa, 1954 from LIFE magazine photo essay, A Man of Mercy. Known for his darkroom wizardry, Smith composited two negatives – the portrait of Dr. Schweitzer and the behind him from one negative with a second negative of the hand and saw in the foreground – to create the famous portrait. © Ken Light, John Kerry preparing to speak at an antiwar rally in Mineola, New York, 1970 (left), Owen Franken, Jane Fonda at a Vietnam War protest in Miami Beach, Florida, 1972 (middle) and composite of two photographs with fake “AP Photo” credit (right). Additional discussion about the photographs can be found in The Real Fake by Ken Light (Digital Journalist) and The Camera Never Lies, but the Software Can by Katie Hafner (New York Times). © Brian Walski/Los Angeles Times, British soldier directing Iraqi civilians to take cover from Iraqi fire on the outskirts of Basra, Iraq, 2003. 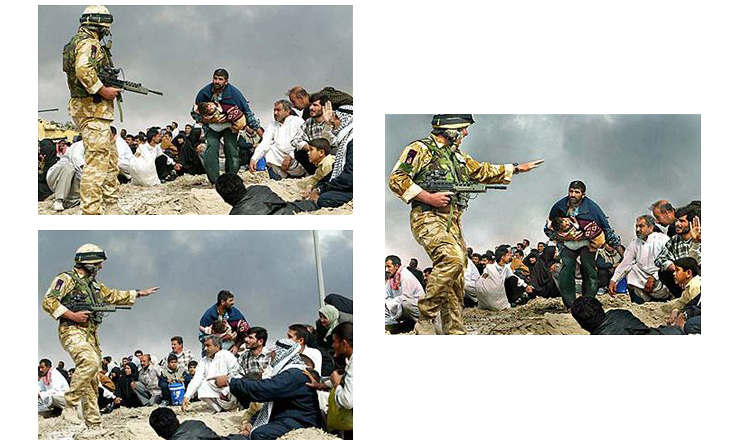 The two photographs on the left were made moments apart from each other and were composited to create the image on the right that ran on the cover of the March 31, 2001 issue of the Los Angeles Times. The next day, Walski was dismissed for violating the Times policy which forbids the altering of news content. Additinal discussion about the photographs and the ethical questions of digital manipulation can be found in Altered by Pedro Meyer (in addition to other editorials on the subject and photography in general at ZoneZero) and Brian Walski Discusses His Doctored Photo by PDN senior editor David Walker. Each of these photographs as well as others within the context of documentary photography suggest a variety of questions that each photographer may need to consider in their working process. What will be the photographer’s relationship to their subject matter? What responsibilities does the photographer have to their subject matter? How does the photographer reconcile their intentions and practice with regards to their subject matter, particularly in the context of photographing “the Other”? After the photographs are made, what becomes of them and of the subjects in the photographs? For whom do the photographs benefit? What ethical and/or moral guidelines will the photographer set for themselves and their working practice?